Sean donated a kidney to his father. “How old will I be when I give you my kidney?” Seven-year-old Liam asked after his father, Sean Downey, donated a kidney to his father. Young Liam knew intuitively that giving was part of the Downey philosophy. Phil Downey, Sean’s father, said he always knew growing up in rural Carp that helping others was important. It was something you just did. He said his mom, who was a nurse at the Civic Hospital in the 1940’s, kept a poem about ‘giving’ that she’d cut out of a greeting card. It was always on the fridge to remind them how important giving to others was. Phil said a copy of that same poem is stuck on his own fridge today. As well, every one of his five adult children have the poem hanging in their house. It is their family creed. About 12 years ago, Phil was diagnosed with kidney disease, which eventually led to kidney failure. Around the same time, Phil was diagnosed with prostate cancer. 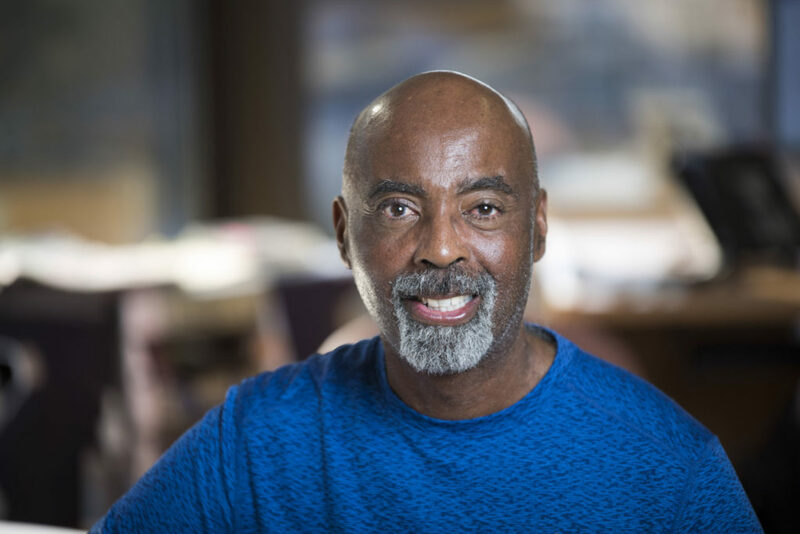 After the surgery to remove his prostate gland, he was encouraged to wait five years before having a kidney transplant because Phil would need to take anti-rejection drugs, which suppress the immune system and increase the potential for cancer. Five years later, Phil was still cancer free, but he was on dialysis and desperately needed a kidney. Gail and his children and step children “threw in the hat,” and volunteered to donate their kidney. Sean, his second son, was the best match. 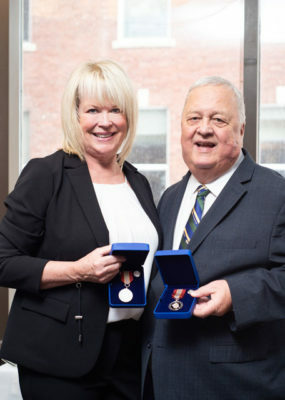 In April 2019, Phil and Gail Downey were awarded the Governor General’s Sovereign’s Medal for Volunteers. In July 2013, Sean and Phil underwent surgery at the same time. The kidney transplant was a success. Phil began to feel better almost immediately. He said he had more energy while still in the hospital than he’d had in years. Recovering together, was great bonding time for Sean and Phil. The father and son had friendly competitions to reach milestones: who could be out walking more; who could do the most, physically or do it the fastest. Over the course of healing together, Phil convinced Sean to join his real estate business. He did, and father and son now work together. 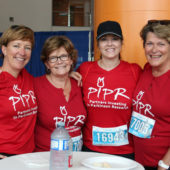 Phil and Gail were so grateful for the wonderful care he received over the years at The Ottawa Hospital that they actively fundraised for critical hospital priorities, such as the CyberKnife, the new Charlie and Claudette Logue Dermatology Centre, and the Rose Ages Breast Health Centre. They realized that philanthropy was also important to their adult children. The family decided to encourage their friends to inspire generational giving in their families too. 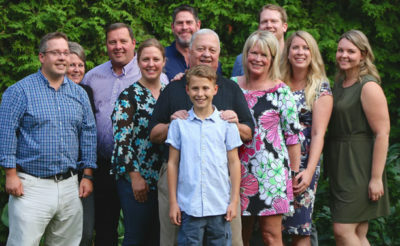 In August, Phil and Gail hosted a cocktail reception in their backyard with their family, and invited their close friends. 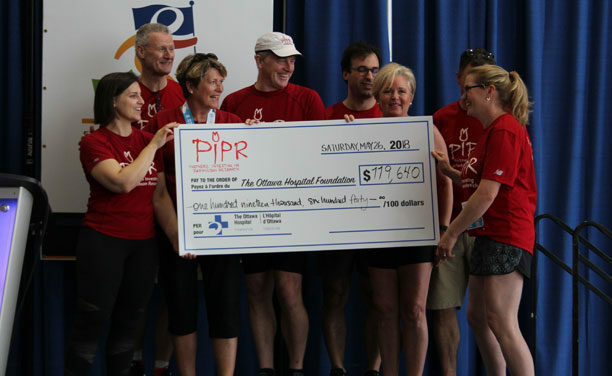 They announced, in gratitude for the treatment and care Phil received at The Ottawa Hospital, they would make a significant donation to kidney research. 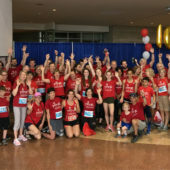 Knowing that the hospital had touched everyone in attendance, the Downeys asked their friends to also consider engaging their own children – the next generation – to support world-class patient care at The Ottawa Hospital. 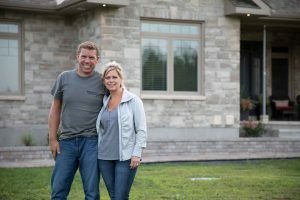 The Downey family is paying it forward, knowing their legacy will be shaping the future of health care in Ottawa for generations of Downeys to come. The timing to get patients with severe injuries to a trauma centre is critical. A new 60-minute paramedic-to-trauma centre initiative saved Adrian Molloy’s partially severed arm. Michael Baine was on vacation in Florida when the governor general’s office called to tell him he was receiving a Sovereign’s Medal for Volunteers. Mike Baine has been a table captain at every President’s Breakfast since 2004. The medal, formerly known as the Caring Canadian Award, recognizes and pays tribute to dedicated people, like Mike, who’ve made a significant contribution to the community as a volunteer. Mike knows many family and friends who have been patients at The Ottawa Hospital, and saw firsthand the great treatment and care they received. 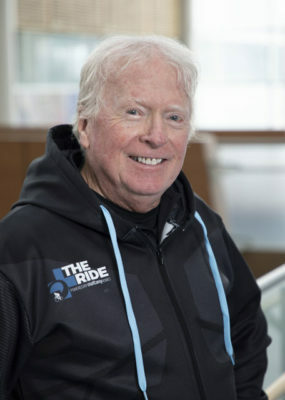 In 2004, he heard about the President’s Breakfast fundraising event, and thought it was a “brilliant” way to inform people about outstanding patient care and research at The Ottawa Hospital. Mike offered to host a table and invited nine people to join him. 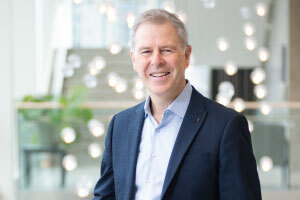 He and his guests were wowed at the hour-long breakfast, hearing patients talk about how their lives―changed by an accident or illness―were saved by The Ottawa Hospital. They also heard hospital President and CEO Dr. Kitts talk about his health-care vision. These extraordinary stories of healing inspired them to make a donation to the hospital. Mike was so impressed by the incredible testimonials, and got such a great vibe from being there, that every year since he has been a table captain, inviting nine friends to also be inspired. Over the last 14 years, more than 100 people have been Mike’s guests at the President’s Breakfast. Mike has been a rider on every Foundation Ride event since it began nine years ago. “Some of my guests have become table captains themselves. 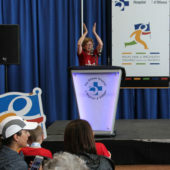 But really, a lot of them are great ambassadors now for The Ottawa Hospital because of the amazing experience that one hour provides,” he said. Then in 2009, when the Foundation set up a focus group to explore the idea of doing a cycling fundraiser for cancer research, they asked Mike to take part. The group gave the event an enthusiastic thumbs-up. 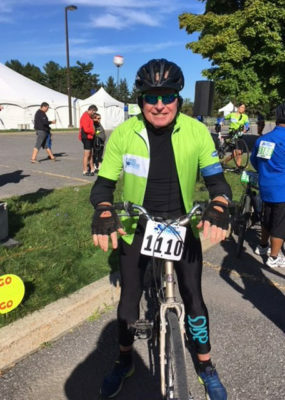 And in 2010, Mike raised money for cancer research, and on September 11, four days before hosting a table at the President’s Breakfast, he got on his bike to pedal the first Ride the Rideau (now known as THE RIDE). He enjoyed the event so much, he signed up the following year and has participated in every ride event since. In September 2018, Mike had a bigger reason to ride after a close friend passed away from cancer. He raised a personal best of $5,000 for The Ottawa Hospital. Mike has also volunteered with CHEO, Children’s Aid Society of Ottawa, and the Youth Services Bureau. Making a difference in the lives of children is another cause close to his heart. Mike was presented with the Sovereign’s Medal for Volunteers at a ceremony on April 9, 2019. 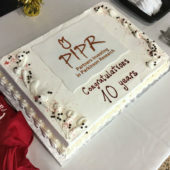 Congratulations are in order to the other Foundation volunteers who also received this award for their exceptional commitment and tremendous support for The Ottawa Hospital: Gail and Philip Downey, Dr. Lothar Huebsch, and Sheryl McDiarmid. 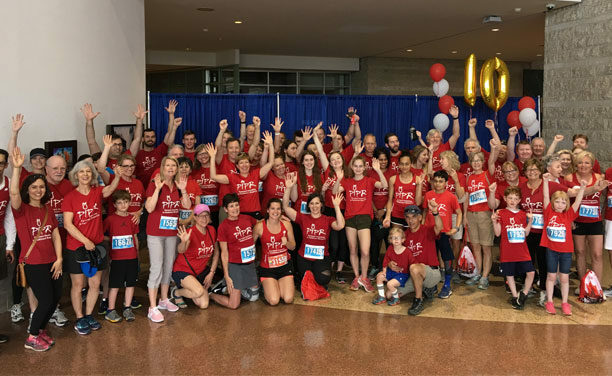 We invite you to email [email protected] to find out more about how to volunteer for events at The Ottawa Hospital Foundation. Fran Cosper’s fingers wrap around the coffee mug. This simple task was impossible two years ago when he couldn’t even lift a finger―or move any part of his body. On Valentine’s Day 2017, Fran arrived at the emergency department of The Ottawa Hospital. He was diagnosed with Guillain-Barré syndrome, a rare autoimmune disorder that attacked his nervous system, destroying the protective sheath around his nerves and paralyzing him. At one point, Fran couldn’t even close his eyes and the nurse had to tape his eyelids shut. Fran was moved to The Ottawa Hospital’s Rehabilitation Centre while his nerves regenerated. He arrived on a gurney, and after several weeks, learned to get around in an electric wheelchair controlled by moving his head. He spent seven months in the rehab centre recovering, and is now continuing his recovery journey at home, with regular visits back to the centre for check ups. Being outgoing, Fran enjoyed chatting with people at the Rehab Centre and easily made friends with staff and other patients. One day, two hospital volunteers, Claude and Chris, showed up at his bedside and asked if they could take him for coffee. “I thought, ‘Okay, cool, a couple of guys want to take me for coffee.’ I gleaned they were volunteers because of their blue vests. So, we went to the coffee shop and started to talk,” Fran said. Chris told Fran that he had an aggressive brain tumour. He had been in the hospital for surgery and treatment, but it was now inoperable. Nonetheless, he felt his hospital care had been so amazing, he decided to come back and volunteer. Fran left the Rehab Centre with the help of a walker on October 6, 2017. A year and a half later, and not yet able to return to his regular work, Fran is getting ready to return as a volunteer. His friend Claude put him in touch with volunteer services, which organizes the 1,200 volunteers who work in every part of the hospital, from waiting areas to the emergency department. Fran has to shadow Claude a number of times while visiting patients in the rehab centre, before he can be on the schedule. He has been fitted for a volunteer’s blue vest and signed up for a two-hour volunteer course with the hospital. Fran knows firsthand how volunteering does make a difference. He sees no better reason to take someone for a coffee. Volunteering is one of the most impactful ways to give back. Give your time and see first-hand the impact you’re having. When the blade on Adrian Molloy’s power saw partially severed his arm, he was rushed to the Trauma Centre at The Ottawa Hospital. He was one of the first to benefit from a new quality improvement initiative that extended the time to 60 minutes for an ambulance to head directly to the Civic Campus, bypassing the nearest community hospital. 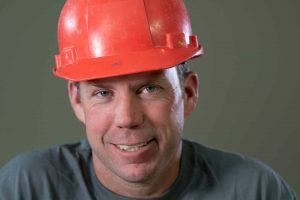 June 20, 2017, was a day like any other on the construction site, until the 14-inch diamond blade on Adrian Molloy’s power saw jammed in the concrete he was cutting and kicked back into his arm. “It happened so quickly, I didn’t even know I was injured,” Adrian said. The 40-year-old contractor had been using power saws on the job for 20 years. He was down in a hole cutting concrete when the saw kicked back. He was covered in dust so couldn’t see his arm, but knew he’d hit himself. He grabbed his right arm above the elbow, and his fingers landed on bone. Adrian knew it was a serious injury, and managed to get out of the hole and head to the road for help. His arm was bleeding badly. Contractor Adrian Molloy underwent two four-and-a-half-hour surgeries to repair his partially severed arm. At the road, two Hydro One workers were sitting in their truck getting ready to leave. When they saw Adrian, the passenger called 911. The driver jumped out, and quickly took off his belt and tightened it around Adrian’s arm in a tourniquet. He was calm, and kept Adrian talking until the ambulance arrived. In the ambulance, Adrian heard the paramedics talking with the dispatch. What Adrian didn’t realize was that he was one of the first patients to be part of a quality improvement initiative that the Ottawa Regional Trauma Program was testing in an effort to get patients to trauma care and provide more successful outcomes. Where Adrian was injured was about a 45-minute ambulance drive to the Trauma Centre. Previously, he would’ve had to go to the nearest community hospital. LeBreton said trauma patients who need resuscitation from life-threatening injury need very resource-intensive care. They require more medical staff, access to operating rooms, imaging capabilities, more blood, and other resources that community hospitals do not have in their emergency departments. 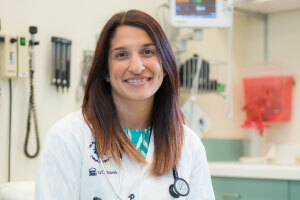 There is a team of health-care professionals at the Civic Campus specifically trained to deal with trauma situations. 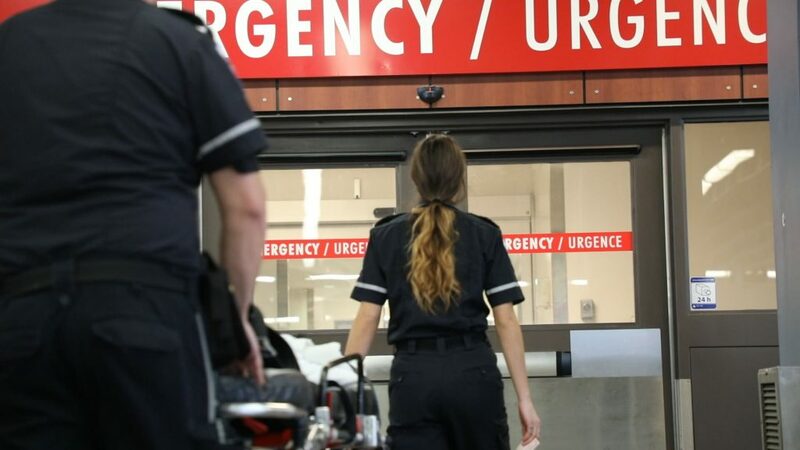 When paramedics notify the Civic Campus Emergency Department that they are bringing in a patient with multiple or life-threatening injuries, a Code 1 Trauma is called over the hospital’s intercom. This alerts the trauma team, which includes trauma surgeons, emergency physicians, nurses, anaesthesiologists, respiratory therapists, and trauma coordinator Mathieu LeBreton, to prepare for the patient’s arrival. A Code 1 Trauma also notifies the blood lab, radiology department, and operating room staff that blood-work, X-Rays, CT scans, and surgery may be needed. The answer was yes. The trauma team was ready and waiting for him when the ambulance arrived. When he was rushed through the emergency room doors, Adrian said he couldn’t believe, “You can get so many people in one room for one patient.” He was in the operating room within 47 minutes from the time he entered the emergency department. The power saw had cut 75 percent of his right bicep, two arteries and a nerve. In the operating room, surgeons reattached his arm. The four-and-a-half-hour surgery repaired arteries and his severed nerve. He underwent a second four-hour surgery to repair the damaged bicep with a donor muscle in November 2017. The Ottawa Hospital’s Civic Campus is the adult lead trauma hospital for eastern Ontario. This takes in an area of 1.3 million people that includes Ottawa, stretches west to Pembroke and east to Hawkesbury. People with life-threatening injuries from Gatineau and western Quebec, as well as patients from Baffin Island and eastern Nunavut are brought to the Trauma Centre. Twenty percent of the population it serves lives in a rural area. The Centre treated 856 trauma cases last year. One hundred and ninety-two of those patients benefited from the extended time guidelines from accident scene to trauma centre, with the average transfer time being 42 minutes. The eight-bed trauma unit is dedicated to patients who have multiple injuries. This could include head or brain trauma, limb loss, vascular, spinal cord, internal organs, multiple broken bones, broken spine, or neck injuries. “Patients come into trauma from emerge [emergency department], and once they are stabilized, they then move through the hospital, as soon as possible, in order to get them back home, into rehab, or somewhere they can convalesce,” said Kelly. Kelly said a patient’s length of stay in the trauma unit can be as short as 24 hours or as long as several months, depending on the severity of the injury and the ability to recover and heal. The health professionals in the Centre plan the patient’s follow up care or work closely with physiotherapy, and rehabilitation services to assess their need for rehabilitation. “I know we often compare ourselves to similar standards from regional trauma perspectives: other hospitals we benchmark against in standardizing trauma care. We look to hospitals like St. Mikes [St. Michael’s Hospital] in Toronto to see their practices, and share ideas and common goals that we are trying to achieve,” said Kelly. The Ottawa Hospital is part of the Trauma Association of Canada where members from across the country share vibrant practices about ways to improve patient care. Hamilton and Kingston also have trauma centres, though The Ottawa Hospital is bigger because of the larger area patients come from. 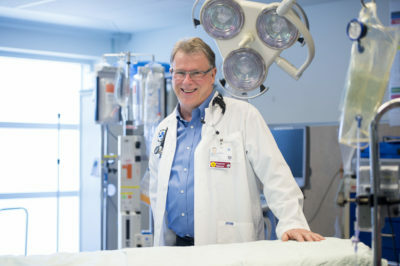 The Ottawa Hospital has one of the largest trauma centres in the province, with Sunnybrook and St. Michael’s as the two largest. However, both Toronto hospitals cater to a dense urban population. The Ottawa Hospital covers a larger geographical area, so the timing to get patients to the trauma centre from a distance and the reason why the 60-minute bypass initiative is critical. “What we found is there have been no negative outcomes yet. People like Adrian have benefitted directly from this,” Mathieu said. Adrian Molloy stands with his wife Shelly outside their home. A year later, Adrian is back on the construction site with full use of his right arm and hand. The Centre treated 856 trauma cases in 2018. One hundred and ninety-two of those patients benefited from the extended time guidelines from accident scene to trauma centre. Innovation is at the core of what we do—developing treatments and providing patient care that is second to none. Being on the cutting-edge of health-care treatment and research requires an investment in new technologies and equipment. Our researchers and medical professionals need every advantage available to push the boundaries of science and ultimately create better outcomes for our patients. To find answers to some of health care’s biggest challenges we need the best people using the best equipment available. Using state-of-the-art technology is how we are able to deliver 21st century health care right here in Ottawa, right now. We believe that if we get the right tools in the hands of the right people, together with the help of our community we can overcome some of health care’s biggest challenges. We’re already one of the largest research and learning hospitals in the country. And we didn’t get there by thinking small and in the short-term. The plan was simple: recruit the best and brightest minds in science and healthcare, bring them together under one roof, find the answers to health care’s biggest challenges. And we were right. Our world-renowned facilities, researchers, medical professionals and clinical trials are the best of the best, so they attract the best of the best. We’ve already made tremendous breakthroughs and there’s more to come. The world is watching what’s happening at The Ottawa Hospital. The impact that one person can have on the future of health care is huge. The impact a group of like-minded community leaders can have on the future of health care is limitless. Our first medical 3D printer—purchased by a donor—is now allowing us to be a world leader in medical 3D printing and was the catalyst for the creation of our medical 3D printing program. 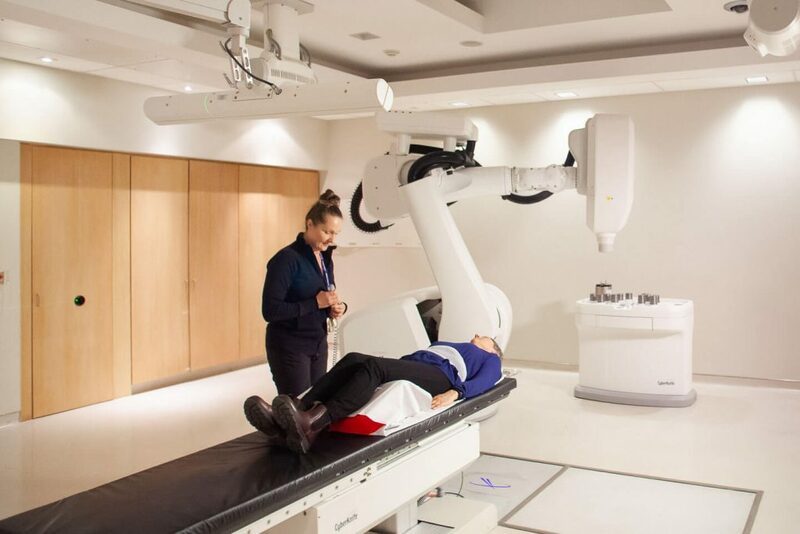 Our CyberKnife, that vapourizes previously inoperable tumours—entirely funded by donors. Our DNA-sequencer, a key piece of equipment to develop personalized cancer treatment therapies—entirely funded by donors. A dedicated mammography machine in our state-of-the-art breast health centre—purchased by a dedicated family who lost their mother to breast cancer. These are only a few examples of how you can change the way healthcare is delivered in your community. We specialize in matching donors who want to help with those who need their help the most. 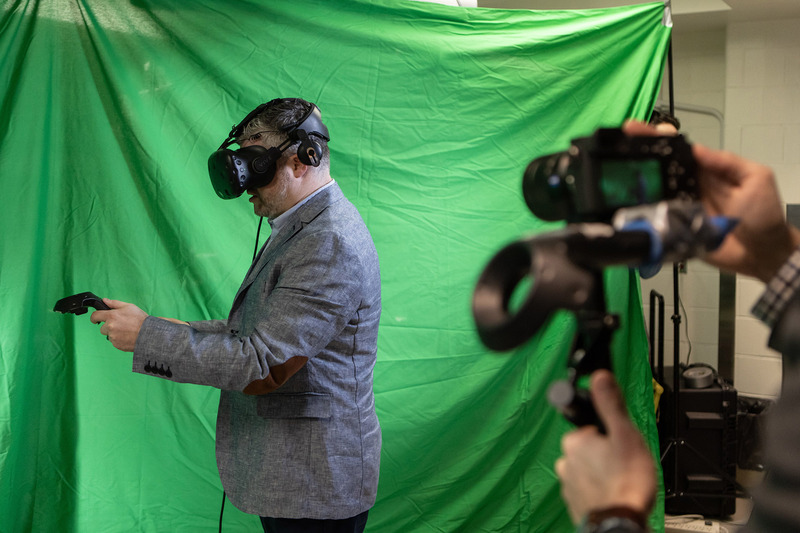 The Ottawa Hospital Foundation is raising money for research and technology so we can continue to push the boundaries of medicine and revolutionize the care we provide patients. Giving patients access to safer drugs, better diagnoses, faster and more accurate assessments of life-threatening injuries, and the most up-to-date diagnostic rules to aid in their diagnosis and recovery. In addition to the best doctors, equipment, and state-of-the-art facilities, patients should have access to safer drugs, faster and more accurate assessments of life-threatening injuries, and the most up-to-date diagnostic rules to create more accurate diagnoses and help speed recovery. Clinical research is necessary to discover better medicine, protocols, and techniques to improve patient care and safety. At The Ottawa Hospital, our vision is to provide every single patient with the world-class care, exceptional service and compassion that we would want for our loved ones. By 2020, our goal is to attain top 10 percent status among North American hospitals in the delivery of safe, high-quality care. Every day our staff, researchers, and physicians work to raise the bar on the standard of care—pushing beyond the status quo to truly be a leader in care delivery in North America. Used to determine a patient’s probability of having a deep-vein blood clot. Decreasing the need for unnecessary tests and procedures thus reducing wait times and decreasing costs. 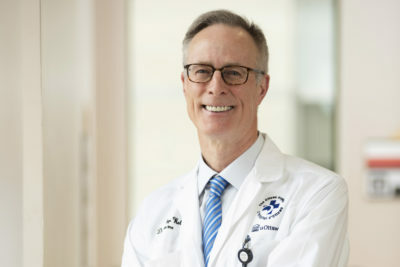 The Ottawa Rules are a set of clinical decision rules developed by Dr. Ian Stiell and his research team at The Ottawa Hospital Research Institute and the University of Ottawa. The rules have been demonstrated to decrease unnecessary diagnostic imaging and emergency room wait times which enhances patient comfort and reduces health care costs. We work hard every day to give our patient’s quicker and more accurate diagnoses, reduce wait times, and decrease the amount of unnecessary procedures to reach a diagnostic conclusion. Researchers from Harvard named three clinical rules, developed at The Ottawa Hospital, among the top five of their kind in the world; The Ottawa Ankle Rules, The Wells Rule, and The Canadian C-Spine Rule are so common across the globe they have even been used on TV shows such as ER and Grey’s Anatomy. 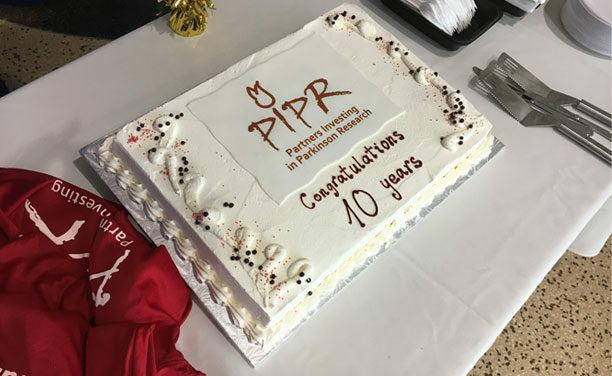 Our Centre for Practice Changing Research (CPCR) enables clinicians and researchers at The Ottawa Hospital, CHEO and the University of Ottawa to work together to design clinical studies that can answer the most pressing questions we have about how best to provide health care. As well, the Ottawa Method’s Centre believes that investigator-driven clinical research is a key element in modern health care systems to improve the prevention, diagnosis and treatment of disease, ultimately, bringing tremendous benefits to patients and society. We believe we have the best people, the best facilities and the best systems in place to deliver on our promise of providing every single patient with the world-class care, exceptional service and compassion that we would want for our loved ones. The impact that one person can have on the future of healthcare is huge. The impact a group of like-minded community leaders can have on the future of healthcare is limitless. At The Ottawa Hospital we are uniquely positioned to make the most out of donor support. We have the right people in the right facilities to make the most scientifically-backed decisions to improve the lives of patients by improving care and outcomes. 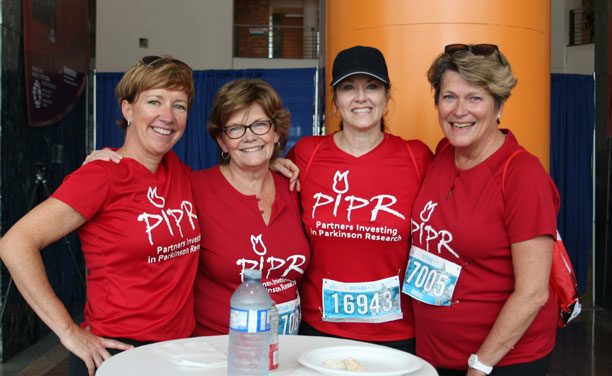 Because we’re a world leader, you can rest assured that a donation to The Ottawa Hospital to aid research to improve patient care means that not only patients in Ottawa will benefit, but also patients around the world. In March 2015, Ashley Ruelland was driving to a bachelorette party in Mont  Tremblant  when another car crossed the centre line and hit her head on. Her road to recovery included nine months  in  the  Intensive Care Unit, trauma unit  and rehab, and continues to this day. 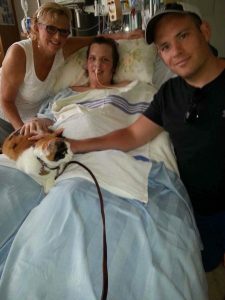 Ashley, her mother Cheryl Ruelland-Jackson, Therapeutic Paws of Canada therapy cat Pecan, and her brother Robbie Ruelland. Life can change in an instant. 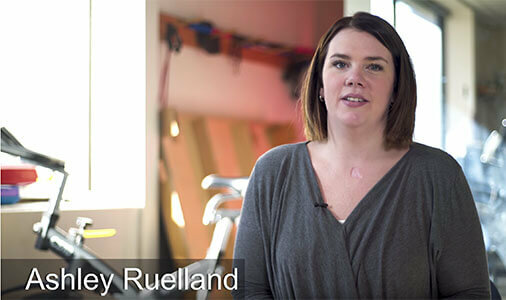 Ashley Ruelland lived to tell the story of her ‘instant’. In early March 2015, then 27-year-old Ashley was living in an apartment with her two cats. She was busy working as a construction manager, part time as an office administrator, and she had started a catering business. She had never really been sick, and had no idea where the Civic Campus of The Ottawa Hospital was located. That changed on Friday, March 13. Ashley was driving the bride-to-be and another friend to a bachelorette party in Mont Tremblant. It was a clear day and the three were brimming with excitement. About an hour from their destination, on highway 323, a car crossed over the centre line, head on into their lane. That was Ashley’s instant. The noise from the impact was horrific, with the earth-shattering sound of grinding metal and fragmenting glass. Miraculously, one of the first people on the scene was a resident from The Ottawa Hospital. She quickly assessed how serious Ashley’s injuries were. It took first responders over an hour to extricate Ashley from the car. 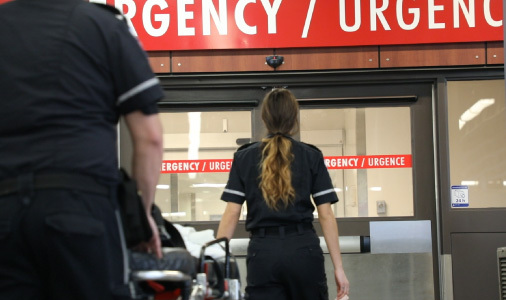 She was rushed to the Hull Hospital, but because of the severity of her injuries, she was transferred to the region’s only trauma centre at The Ottawa Hospital Civic Campus. While her friends had relatively minor injuries, Ashley had a grocery list of broken bones: from her right big toe to her ribs and just about everything in between. Most significant were an open compound femur fracture, an open left elbow fracture, right humerus fracture, crushed and broken left and right foot and ankle fractures, an open book pelvis fracture, and multiple broken lumbar vertebrae. “This lady’s life changed forever that day,” said Dr. Guy Hébert, Head of the Department of Emergency Medicine, when he looked at the hundreds of files related to Ashley’s surgeries and treatment. She remained in an induced coma in the intensive care unit for two months. She endured numerous reconstructive surgeries, 100 hours of orthopaedic and internal surgery, and over 100 blood transfusions and infections. A year and a half after her “instant”, Ashley was able to walk again with the help of a walker. Four months after the crash, Ashley began physiotherapy in her hospital bed and could finally eat solid food. She had lost all of her hair and had severe nerve damage, chronic illness myopathy and neuropathy. “I couldn’t feed myself, brush my own teeth or move much at all. The first couple of weeks seemed like torture. The nurses would set little goals, like sitting up in my wheelchair for 20 minutes a day. The physiotherapist and occupational therapist didn’t know if I’d ever walk again. I was scared to think of the life that was waiting for me outside those hospital walls,” said Ashley. But then her first real sign of recovery came a few weeks later when she was able to feed herself. In August, Ashley moved to the rehabilitation centre at the General Campus where she began an intensive regime of physical, occupational and psychological therapy programs. Just before Christmas, nine months after the accident, Ashley left the hospital. Although she was in a wheelchair and hadn’t made many functional gains, Ashley felt stronger and healthier. The young woman continued as an outpatient with rehab, and had her last surgery in February 2016, which allowed her to transfer from her bed to chair, independently. 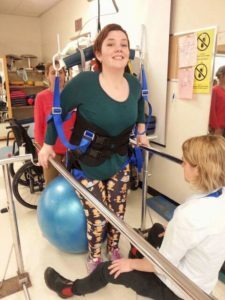 Over two years later, Ashley is walking again. In fact, not only is she walking but she’s travelling, recently returning from Ireland. She’s also in school and looking to buy a home. 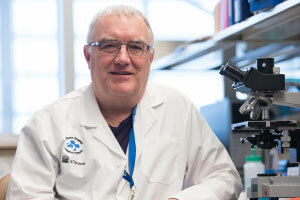 Made-in-Ottawa platinum seeds are improving an already incredibly powerful and precise radiosurgery treatment system for tumours in the head, neck, and organs, such as lungs and liver. The “seeds” are one millimetre by three millimetres, a third the size of a grain of rice, and made of platinum. 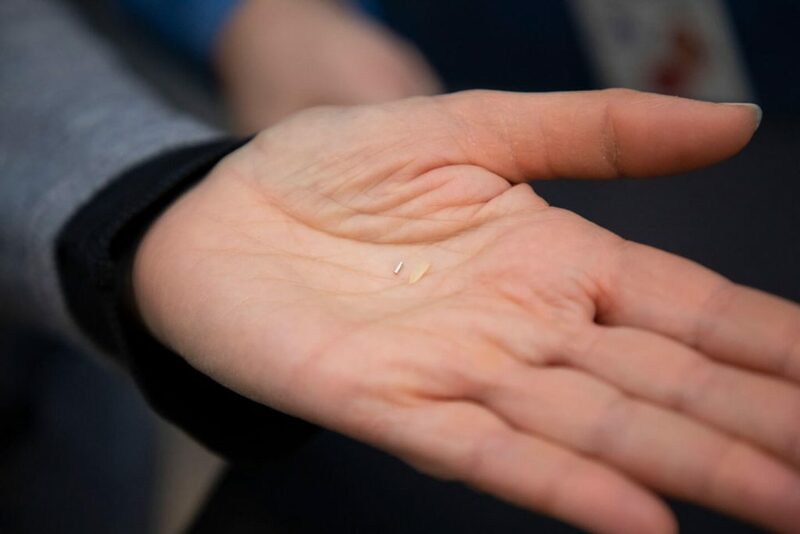 These tiny seeds, created by researchers at The Ottawa Hospital, improve the CyberKnife robot’s accuracy in detecting and delivering precise doses of radiation to tumours in the brain and body. Platinum seeds, a third the size of a grain of rice, are improving the accuracy of CyberKnife treatments. 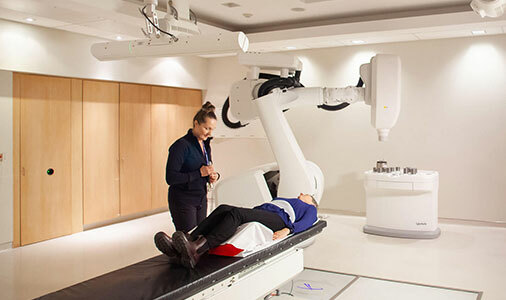 CyberKnife uses X-rays and complex precision software to track and focus radiation directly to the tumour. With accuracy of less than a millimetre, there is virtually no radiation spill over to normal tissue. As a result, patients have much better responses to this type of treatment compared with traditional radiation where a larger area is targeted. 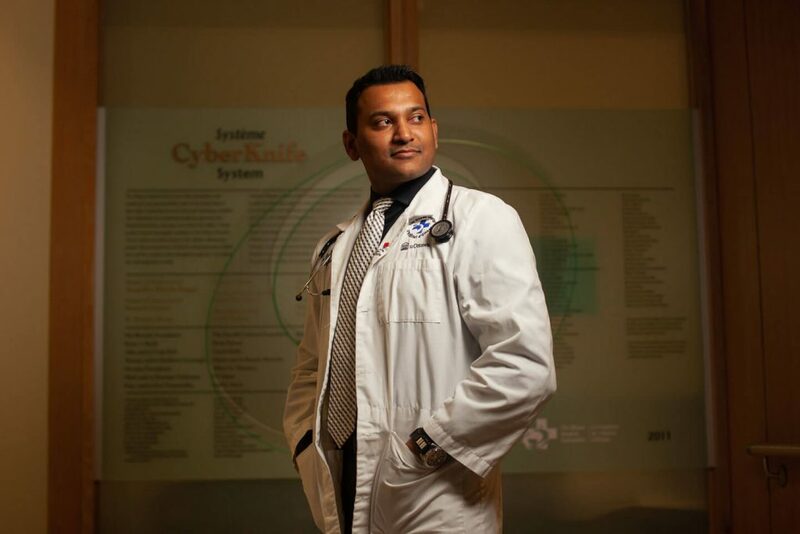 “Because CyberKnife delivers a high dose, it’s considered similar to surgery without using a scalpel, so no blood loss, no pain, no ICU stay, or recovery time,” said Dr. Vimoj Nair, one of the radiation oncologists trained to prescribe CyberKnife treatment. 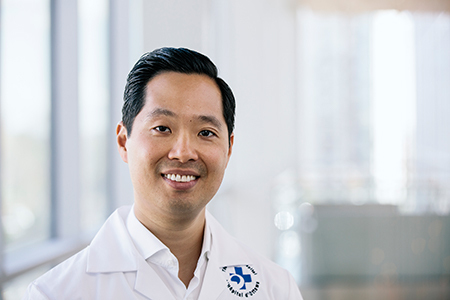 Ninety percent of CyberKnife treatments are for malignant or benign brain tumours, but CyberKnife’s image guidance system can also treat tumours in organs that move constantly, such as the lungs, kidneys, liver, prostate gland, and lymph nodes. It can precisely align the radiation beam to the tumour even when it moves. 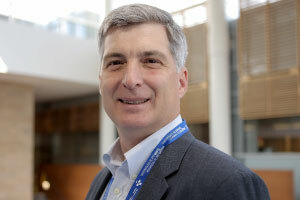 But radiation oncologists and researchers at The Ottawa Hospital are refining techniques to further enhance the performance of this state-of-the-art technology to improve patients’ outcomes. These techniques are ultimately changing radiosurgery practice. Radiation oncologist Dr. Vimoj Nair said platinum seeds improve the accuracy of CyberKnife radiosurgery. The Ottawa Hospital is one of the first centres in North America to use these platinum seeds. In the past, oncologists used tiny gold seeds, but they were difficult to see in the MRI sequences used to view the tumour. This made the treatment planning less accurate. Dr. Janos Szanto, medical physicist, and Dr. Len Avruch, radiologist (now retired), were the initial brains who took platinum wire (otherwise destined to be jewelry), cut it into minute pieces, and then put through a sterilization process to ensure the seeds were appropriate for insertion into the human body. It worked. They were visible to the naked eye, more visible in an MRI than the gold seeds, and could be detected by CyberKnife. Radiation therapist Julie has delivered CyberKnife treatments since 2010. 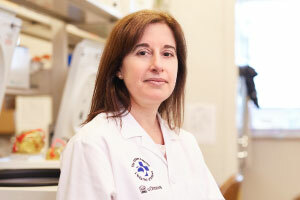 “The benefit of this technique is we see both our target and seeds more clearly together, which provides the best use of advanced imaging and improves the accuracy,” said Dr. Nair, who called the discovery novel research and application that positions The Ottawa Hospital very favourably on the world stage. Dr. Nair was the first author on the research paper published about the platinum seeds. 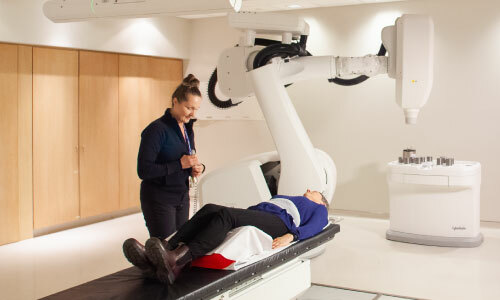 He said that researchers and clinicians are continually sharing innovative CyberKnife techniques they’ve developed, like this one, at conferences and with other health centres across Canada and globally. In September 2018, he gave presentations on The Ottawa Hospital practices on clinical uses of CyberKnife at a conference in India. 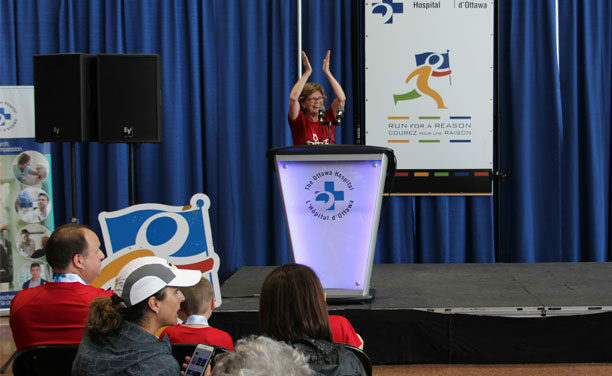 Read more about the history of the community-funded CyberKnife at The Ottawa Hospital. 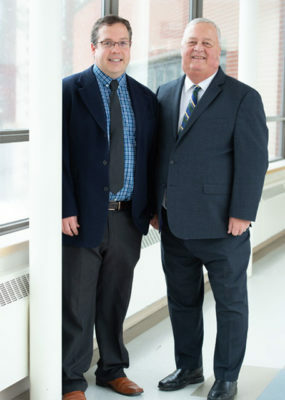 The Ottawa Hospital is providing advanced treatment of benign and malignant tumours in inoperable places with state-of-the-art technology for the best possible patient outcomes.